Indeed, “crazy” is an apt descriptor for the TV Land’s most recent additions, the talk show Throwing Shade, which premiered last month, and the scripted comedy Teachers, which just began its second season. (Both are on tonight, at 10 p.m. and 10:30 p.m., respectively). 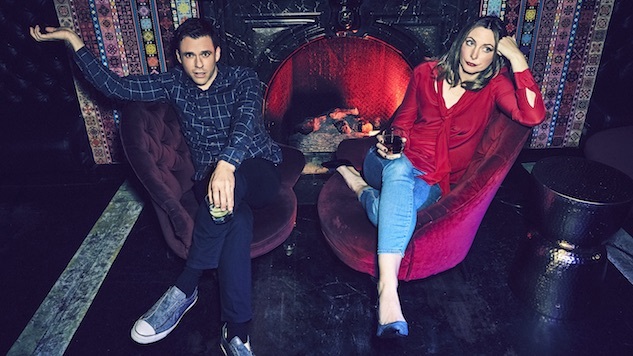 Based on the Maximum Fun network’s podcast of the same name, Throwing Shade offers a combined point of view distinct from every other cable talk show: hosts Bryan Safi and Erin Gibson are a gay man and a straight woman, each giving voice to concerns that are woefully underrepresented in the pantheon of late night comedy. Recorded weekly in front of a live studio audience, the show is a crystalline distillation of the podcast—social commentary in the form of buoyantly acidic repartée—with the addition of pre-recorded sketches. It’s a satisfying blend. Both hosts are effortlessly skilled behind the desk—consider this segment on the lie of tolerance toward LGBTQ people—and their background at the Upright Citizens Brigade Theatre shines through the pre-recorded material, which brings a dynamic energy and an often-gorgeous cinematic flair. Still, Safi and Gibson’s top priority is recreating on TV the feel of their podcast—that is, having two friends in your ear, riffing about whatever comes to mind. “It’s the million dollar question and it has been the number one thing on our board to preserve,” Safi said in an interview before the premiere. “On the podcast we talk constantly about, ‘Wouldn’t it be hilarious if we did this thing?’ and break out into silly characters.” On television, naturally, they can do this with sets, costumes and actors rather than merely their voices. But their interests as social and political commentators have not changed. “We’re coming at this focusing on issues affecting women and LGBT people,” Safi said. “That’s what we know, that’s what we like.” An early favorite sketch might be “Women’s Place in Space,” which pokes at the trend of movies about women astronauts driven into space by personal tragedies. “Local Dicks,” a recurring segment on bigoted and/or otherwise incompetent local politicians, is a refreshing spiritual successor to the Colbert Report’s “Better Know a District.” Another standout is the weekly “Shade List,” in which Gibson and Safi simply yell people and/or things who have caused some harm, whether that harm be institutional injustice or the sinking of the Titanic. Another option, perhaps, is offered in the sitcom Teachers, which airs just before Throwing Shade. Though it may not be written anew each week, the series’ second season is no less concerned with the pressing issues of our day. One early episode deals with school council election that pits a man against a woman, the latter judged by a harsher set of standards; another criticizes the Common Core, which Betsy DeVos, the presumptive Secretary of Education, has long supported, despite recent statements in opposition to it. More broadly, Teachers takes an honest, thoughtful look at the challenges faced by public educators that similar shows do not—at least, not with former public educators in their writers’ room. Still, she cautioned, the Katydids never stray far from their roots in sketch. “A lot of our stories are very character driven,” she said. “So we think: What’s the best or the worst situation we could put this character in? And then we stretch it out. But we don’t like any of our stories to be too predictable. So every story, around the second act, we think ‘Okay,’ we know what the straightforward story would be, and then try to work in some kind of change.” In one of the episodes made available to critics, this approach leads to some especially delightful hijinks involving guest star Haley Joel Osment. Teachers airs Tuesdays at 10 p.m. on TV Land. Throwing Shade airs Tuesdays at 10:30 p.m.